To support our advocacy work on concrete legislative proposals and recommendations, we collaborate with partners from the Czech Republic, Poland, and Slovakia to prepare and publish reports, case studies, data analyses, and examples of international best practices. Supported in part by a grant from the Foundation Open Society Institute in cooperation with the Think Tank Fund of the Open Society Foundations. Monitor specific areas (and cases) vulnerable to political corruption and misuse of public money. Develop and use tools and methods of detection and prevention of political corruption, including legal tools, economic analysis, and profiling of key persons. 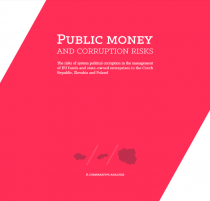 Analyze and report findings about key factors of political corruption and misuse of public money, contributing to the EU level anti-corruption mechanism. Involve other stakeholders, communicating the identified problems and findings to law-enforcing agencies and decision-makers as well as to civil society players, media, and public. The study compares Czech, Polish, and Slovak regulations and practice, identifying major gaps both in the national and EU legal framework that fundamentally increase the risk of political corruption and mismanagement of EU funds. The report results from a year-long research by local teams of lawyers, economists and political analysts, and “shadows” the first EU Anti-corruption report published in early 2014. Analyzing major risks of political corruption in the management of public funds, the study sheds light on why millions of euros continue to be misused and why implementation of EU funds regularly ends up in criminal prosecution in all three studied countries. It concludes that European Commission and the three studied member states were ineffective in regulating anonymous and offshore recipients of funds and allowed management and oversight of the programs to be riddled with political conflicts of interest. The report includes a number of concrete examples from all three Member States and offers a set of recommendations for both national and EU level decision-makers. Read more about the study findings. Frank Bold is a public interest law organization with offices in Prague, Brussels, and Krakow. Naši Politici gathers and publishes information about the activities of Czech public service and its elected representatives with an emphasis on potential conflicts of interest. The Centre of Applied Economics is a semi-academic NGO engaged in data-driven research on the public sector. KohoVolit.eu is a non-governmental organization and an eponymous website aimed at promoting democracy by encouraging the political awareness of citizens and public control of elected representatives. Centrum Cyfrowe Projekt: Polska works towards social change and enhances citizens’ participation through the use of digital technologies and open, cooperative models based on sharing knowledge and other resources. Slovak Governance Institute is an independent civic association creating and supporting solutions to increase the quality of the process of public funds allocation. With the financial support of the Prevention of and Fight against Crime Programme European Commission - Directorate-General Home Affairs. The project has been funded with support from the European Commission. This communication reflects the views only of the author, and the European Commission cannot be held responsible for any use which may be made of the information contained therein. The project was supported by a grant from the Open Society Foundations.